Reader, you know I love travelling to new cities and experiencing book events. You know I enjoy talking to all the book lovers who stop by the table, and I absolutely adore it when I can match new readers to a great book. 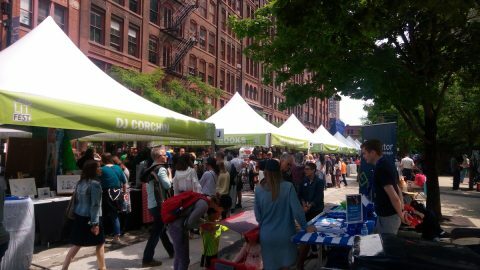 You know this about me, so naturally, you’ll understand that I was excited to attend the Printers Row Lit Fest in the iconic Printers Row neighbourhood of Chicago, an outdoor event dedicated to reading, writing and the love of books that took place June 9th and 10th. 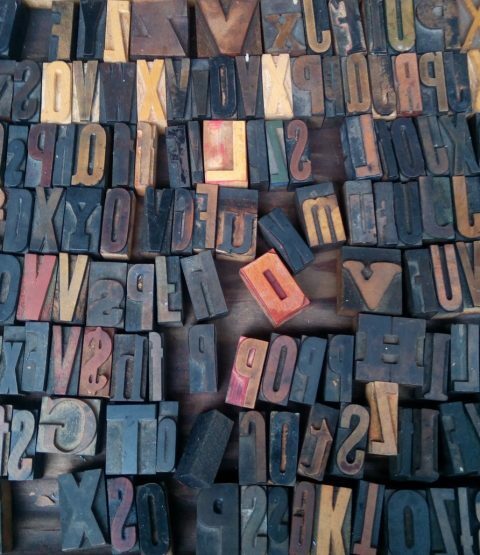 One of the vendors at the festival sold wooden type. I could not resist snapping a photo. But reader, it rained. It rained so much. 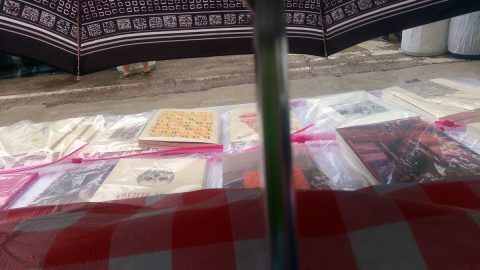 On Saturday morning it was drizzly and a bit chilly, but I lugged my spoils and a selection of books a few blocks down Dearborn Street to begin setting up. When I arrived at the PQL table, I quickly determined that I liked my spot. Shady tree in case of sun? Check. Close to the attention-grabbing and always-busy bookstore tents? Check. Near the outdoor stage for a bit of music and entertainment. Check. All in all, a pretty good deal. Only problem? Everything was wet. Readying for a day of rather wet bookselling. 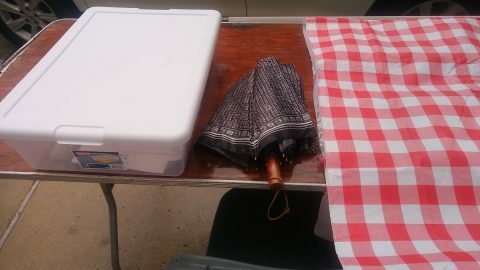 Must-haves include: protective plastic bin, waterproof(ish) tablecloth, preferably with a bit of weight to it, and definitely a good umbrella. 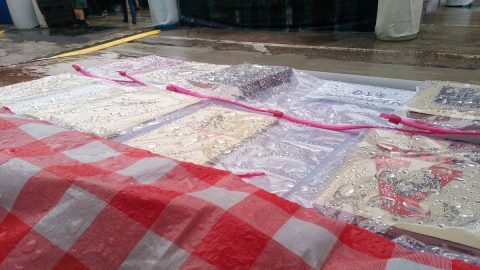 The drizzle let up just long enough for me to lay out the tablecloth, put the books in their protective bags, and generally get myself geared up for a day of (hopefully dry) bookselling. My early view of the fair was somewhat mediated by my hardworking umbrella. 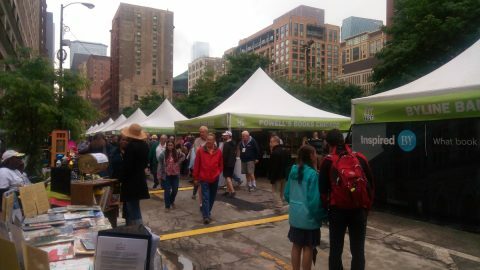 But of course, Chicagoans are made of sterner stuff, so despite the clouds and the drizzle, festivalgoers started to arrive. Mere raindrops, puddles and chilly temps won’t keep a true book lover from a book festival! But then, something magical happened: the sun came out! After that, people came out in droves to Printers Row. It was quite the family event, with children and pets coming along to join in the fun. The stage behind me had a couple of short concerts, and if they were primarily geared towards kids and sounded like something out of The Wiggles, well, who was I to judge? I bopped along anyway. I even got a nice visit from the fine folks at the Chicago Public Library from the booth across the way. And they bought presents! Of course, nothing gold can stay. Day two of the festival on Sunday was decidedly drearier. It was downright cold, and by lunchtime I was dreaming of some steaming hot soup for dinner. The rain came down like mad, and even the hardy midwesterners stayed inside for most of it. In the end, I think last year’s sizzling temperatures and full sun during the festival were slightly more uncomfortable than this year’s rain, so let’s call it a win, shall we? 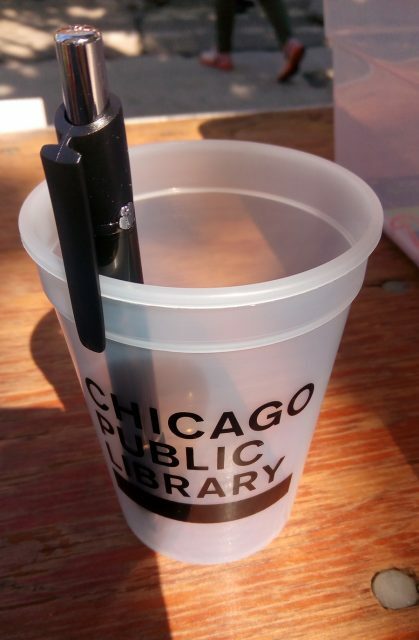 Thanks to everyone who stopped to buy a book from us in Chicago–or just to chat! It was so lovely to meet you all, and we hope you enjoy your books. 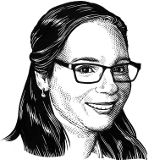 This entry was posted in Letters from the Porcupette (the Intern's Blog) and tagged book events, book festivals, Chicago, Printers Row, Printers Row Lit Fest. Bookmark the permalink.